One of the more unlikely visitors to the rock ‘n’ roll wilderness, this group of widely acclaimed ex-jazzmen who’d felt they’d been forsaken in that realm and forced to endure a long stretch of inactivity on the recording front, make their third appearance on these pages after being reborn as rockers. That hardly seems promising any way you look at it. In a world that likes to slot musicians in easy to define compartments and keep them locked within that realm forever after, those who suddenly shift gears and wind up in another part of the musical universe altogether are often treated with suspicion, if not downright hostility for their genre hopping… that is if they’re even acknowledged for making the transition at all. 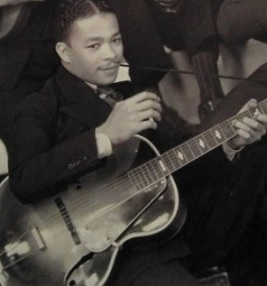 But while it may be true that a lot of rock’s earliest practitioners at least had some experience in jazz circles we’ve seen plenty of evidence that shifting from the more technically precise musical form which constituted jazz of the mid-1940’s to the more ragged and unwieldy style that was rock wasn’t as easy as it appeared. To date it seemed that the better the jazz musician was the more compromised their rock output tended to be and since Edgar Hayes was someone who ranked high on the list of former jazz stalwarts when it came to skill level, his forays into rock ‘n’ roll, however well intentioned, would probably end badly. So imagine our surprise when after two such ventures, one under their own name back in January and another backing Clifford Blivens this month, we find that is hardly the case at all. In fact as improbable as it may seem Hayes and company are in many ways teaching the younger rockers a thing or two when it comes to musical adventurism. The scarcity of historical recognition for Edgar Hayes And The Stardusters when it comes to their contributions to rock ‘n’ roll is both surprising and yet at the same time all too predictable. It’s predictable of course because of the aforementioned uneasiness people have for equating jazz with rock, even though they have far less of a problem with blues acts or country artists getting (often undue) credit for testing the rock waters. Throw in the fact that all of rock’s earliest years are almost criminally neglected in the larger stories as the target demographic for these histories differ greatly from those who were rock’s original audience and as such are usually far more interested in simply reciting the names familiar to those of later vintage and so that’s where the focus tends to be. All of that is unfortunate but not altogether unexpected. But the surprising aspect of Hayes’s wholesale exclusion from the story is the fact he was actually verifiably successful at rock, scoring a legitimate hit his first time out with Fat Meat ‘N’ Greens and notching more hits (either regional or next time out on the national charts) with the work that followed. It’s kind of hard to dismiss something as being historically insignificant when there’s ample evidence to show it was anything BUT at the time. But of course all of those reasons are probably more notable for those like us who actually find the details of recordings and chart placements and other boring minutiae rather interesting. Not everybody does and so there’s another reason why it’s hardly surprising to find Hayes and company being completely ignored for seven decades that followed. But then there’s one thing which rightly should override those other reasons and restore the recognition of Edgar Hayes and The Stardusters to at least some level of widespread respect and credit for what they released in 1949… That would be that the music itself is so obviously ahead of its time that it practically DEMANDS to be heard. If you want to try and make excuses for the lack of coverage down the road your only reasonable case might be that because they were lacking a vocalist their records had one less element to draw modern interest. That’s hardly a viable reason of course but considering that instrumentals have typically fallen short in the praise department no matter what era they’re from it’s as good an explanation as any I suppose. But in the late 1940’s rock scene instrumentals were as sure a bet for exposure as anything, even though The Stardusters were going about it in a much different way than most who got hits in that field, since they were doing so with benefit of a saxophonist, or any horns for that matter. We all know the tenor sax had been the dominant rock instrument to date, certainly in the instrumental category, and so a group featuring a piano and electric guitar as its two soloing instruments had an uphill battle for finding an audience. Yet find one they did, presumably because if you heard what they were laying down you’d be too enraptured to even notice the lack of any horns thanks to the presence of Teddy Bunn, who was as forward thinking a guitarist as we’ve come across to date and someone who seemed hell-bent on establishing that mostly neglected instrument as a centerpiece of rock’s evolving sound. On Edgar’s Boogie things kicks off with the spotlight on Hayes who lays down the heavy left hand riff that forms the foundation of what’s to follow. His playing his assertive and to the point and yet while it may be what you notice on first listen, the more you focus on the sonic palette they’re creating the more he fades into the background as you inevitably pick up on Bunn’s electric guitar lines that are snaking their way through the rhythm. Neither of these men’s work in this intro could rightly be called a solo. For starters they play at the same time and a solo tends to indicate only one is playing, or at least only one instrument is highlighted at the front of the mix. The effect they have playing in tandem is thoroughly captivating however, allowing your brain to seamlessly switch back and forth from one to the other without losing the song’s atmosphere or its surging momentum. Hayes though does get the first genuine solo, his right hand offering up a vibrant collage of patterns, slicing and dicing them up into bite sized pieces, each one with a little different feel and in the process creating a byzantine effect where you’re never quite sure how it will play out or if any of them are leading towards a more coherent melody line. But since his left hand never lets up on that rhythmic underpinning it hardly matters much. No, this isn’t shaping up to be something you can hum along to, or even remember how it progresses once the record shuts off, but while it’s playing it never fails to at least hold your focus. If by chance though you DO let your mind wander without something more tangible to grab on to that sense of elusiveness will cease to be a concern once Bunn makes his reappearance. The number of guitar wizards we’ve heralded on these pages in rock’s first two years have been comprised of rather a short list. The guitar, as we keep pointing out, wasn’t rock’s primary instrument at this time, mirroring the secondary role it held in almost ALL forms of music in the recording era. Part of this as we’ve said in the past was due to the problems having guitars being heard in a larger musical ensemble in the days when it was acoustic rather than electric guitars being played. Once the electric guitar’s kinks got worked out in terms of construction of the body, the pickups and amplifiers it still took a number of years for the next generation who adapted to it to work on their skills as they matured and make their presence known upon reaching adulthood. So understandably it was a slow process, something that was further exacerbated by the music industry itself being skeptical or even reluctant to change their mindsets about the usefulness of the guitar in arrangements. For the bandleaders, record producers and even guitarists themselves who came of age under a different set of ground rules, everybody involved seemed hesitant to embrace the change. Bunn himself was no different in this regard. He’d been an accomplished acoustic guitarist whose shift to electric at the dawn of the 1940’s found him actually being given less to do when called upon to play, which presumably is one of the reasons his recording opportunities soon dried up and he was exiled to the domain of club musicians where he hooked up with pianist Hayes who had been jettisoned from the ranks of recording star for different reasons. But it was during their time playing the California club scene together where Bunn unlocked the key to taking advantage of the electric guitar’s possibilities by embracing its sinister qualities that were found in its edgy tone and then brandishing that weapon sparingly within a more traditional structure, making its sudden appearance within songs seem even more thrilling and dangerous. That’s precisely what happens on Edgar’s Boogie where he leaps into the picture after Hayes yields the spotlight and Bunn proceeds to rip the song to shreds with the sharp precision of a master surgeon. His playing is dazzling, especially since we have so few precedents in rock that surpass it – Goree Carter aside – and because of that rarity at the time it stands out all the more. But even today, after decades of having the guitar forcibly thrust to the forefront of the rock image, his performance is still genuinely exciting to hear, retaining an almost effortless command. He’s careful not to get too carried away with it after his explosive intro, holding back on the distortion and volume so as not to frighten the masses who were still unused to such calamitous sounds, but he manages to keep it sounding lethal in its mere presence. Then, out of the blue (and contradicting our earlier note of them being a band without any brass section to call upon) here comes a horn to add yet another wrinkle to the production. Though a trumpet not a sax, which is actually more in line with their jazz background, it stays in the background offering only a distant counterpoint to the growing excitement the others are laying down. But it plays with the wailing abandon that adds considerable tension to the arrangement, making it seem as if it’s all on the verge of ripping loose from the moorings. The drums and bass are rock solid throughout all this with Hayes anchoring their work with his steady almost metronomic left hand, then they discreetly recede leaving it up to Bunn to carry the ball to the end zone as they settle back into the opening rhythmic pattern as it winds down. Though you might not be inclined to call it truly explosive at any point during the song, the combined effect is one of sustained tension and a skittering vitality that is hypnotic in its effect on you. No matter how you cut it Edgar’s Boogie is a powerful entry into the rock canon. It takes the general attributes of what rock has been in terms of the feeling it exudes and reshapes it to suit their own specific components. There’s no outdated approaches found in any of it, even the trumpet is used to strong effect. Any reservations about their credibility as rockers coming from the jazz world are obliterated right off the bat. In the past we’ve seen records – by Jimmy “Babyface” Lewis for one – who’ve shown similar chops on the guitar but those involved seemed unsure of how to work such a powerful new component like that into the mix and so it was awkwardly shoehorned into outdated arrangements to the detriment of the songs. You knew that if everybody could just take a step back and study what worked about those experiments (the futuristic guitar work) and what didn’t (everything else) and focus on shoring up the deficiencies the next time out then eventually it’d pay off. Well that’s precisely what Teddy Bunn, Edgar Hayes and company have done for them at last – shown them the way. Edgar’s Boogie is a record that pulls the rock train further along the tracks while still managing to keep it in sight of what they’ve left behind so others can hopefully keep pace. In proving that this formula can work those who follow this trail from here on in who don’t try and meet these advances are going to seem all the more outdated. In other words the ever shifting ground rules of rock have shifted once again. We’re still a long ways off from a radical transformation of the entire sound of rock ‘n’ roll, but if you’re the kind who still finds rock somehow incomplete without a prominent electric guitar in the mix, well, here’s your chance to appreciate one of the few 1940’s rock releases that will satisfy your own personal requirements while still managing to fulfill the other requirements of the era in question to make it equally potent for those who refuse to peek too far around the corner for a glimpse into tomorrow just yet. 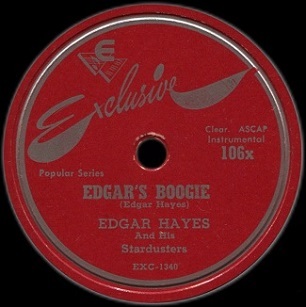 Leave a reply on "Edgar Hayes & His Stardusters: “Edgar’s Boogie”"